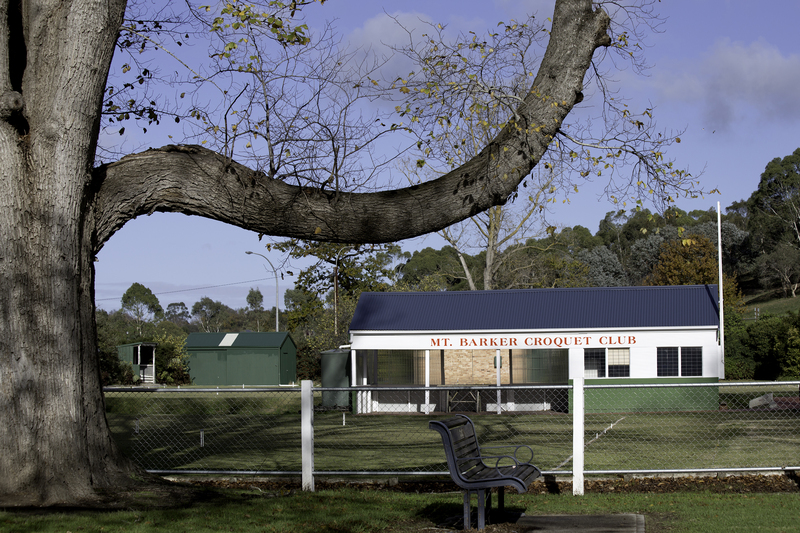 Bough of a giant English Elm tree frames the equipment shed and shelter of the Mount Barker croquet club. Today croquet is enjoying a resurgence in popularity because of its social aspect and its flexibility as a tactical game that challenges the mind yet is not as physically demanding as some other sports. There are a variety of types of croquet to try that can take as little as 40 minutes (golf croquet) or some hours for the more traditional game of association croquet, where it has been compared to snooker on grass. In South Australia there are 38 croquet clubs with a membership of over 1000 active players who, as well as enjoying the social aspect of the sport, may compete in local, state, national and even international championships. Australia is the largest croquet playing nation in the world with over 8000 players. Croquet is one of those games that many people haven’t tried, so are drawn to it out of curiosity. They soon discover how enjoyable it is and how it accommodates men and women equally, and can be as competitive or as social as they like. Members at clubs enjoy passing on their knowledge with budding new players young and old and welcome any interested member of the community to come and try croquet at their club. Younger players are being drawn to the game by Croquet SA initiatives such as the new Hammer Time program, where the experienced members take great delight in helping them play. This interaction between generations in the community really brings people together and is a fabulous example of the State Government’s strategy for an all age friendly community. Clubs work hard to present their facility as an inviting and modern venue where the whole community can enjoy croquet. Clubs are often located in lovely ambient surroundings, when coupled with the lush croquet lawns are a delight for anyone to enjoy. Hyde Park club, located in the Unley Council area is one such club. In an effort to make their facilities more attractive for their members and guests they recently purchased some new chairs – chairs that were safer and more comfortable that the 40+ year old ones they replaced. The Club is very appreciative of the Grants for Seniors funding it received for the chairs through Office for the Ageing. So, step up to croquet, click here for more information or phone 8271 6586 to find your nearest club. This is an article is from the magazine “The Weekend Plus”, a South Australian Government Publication devoted to South Australian Seniors. It is well worth a read, even if you are not from South Australia. I trust they will not object to my reproducing it in this blog. This entry was posted in Croquet, Health & Lifestyle. Bookmark the permalink.